﻿﻿﻿﻿﻿﻿Waterfront Dining at it's best serving freshly produced food and great service! We will not be open on Christmas Day but will be open every other day from 8.00am to late every day! Remember we NEVER charge holiday surcharge. ﻿Alfresco's Restaurant & Bar is a family run business located on the waterfront in Paihia in the beautiful Bay of Islands. Alfresco's opened it's doors in October 2008 and has firmly established itself as a favourite for locals and tourists alike. We are open everyday from 8.00am with a simple aim to serve fantastic food, great coffee, delicious desserts and offer outstanding service. We are proud to deliver warm and friendly service that is at the same time both professional and knowledgeable. Our menu has a wide selection of freshly prepared seafood as well as plenty of options for the carnivores and vegetarians among us! We offer a fully licensed bar serving a great selection of New Zealand wines and beer as well as some international favourites perfect to compliment your meal or a casual drink. 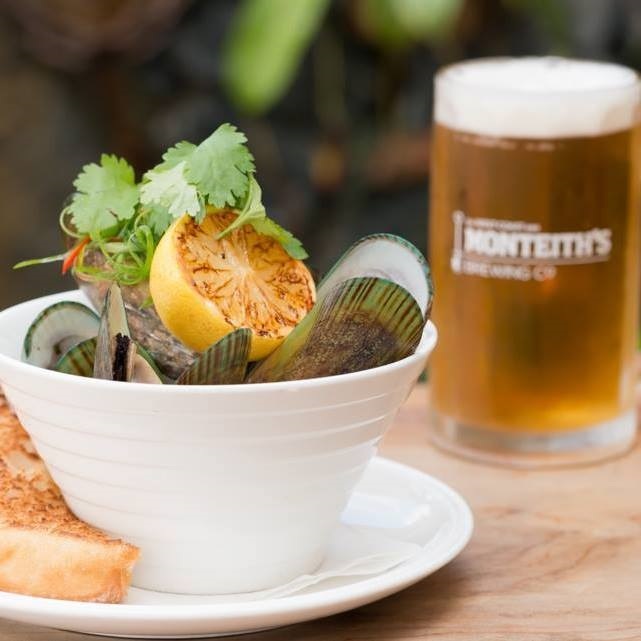 We have happy hour every day 3pm - 6pm with House Wines & Draught Monteith's Beer. Alfresco's is available for group bookings and our head chef can work with you to design a menu to suit your needs. Please let us know of any dietary constraints you may have and we will do our best to cater to them.